We’ve highlighted some of our favorite bands and DJs around town. The Sevilles have shared the stage with notables from the music world and beyond, including the Temptations and President Bill Clinton. They’ve played for, among others, the Ambassador of Denmark, Jessica Lange and Mikhail Baryshnikov (“They’re much shorter than you’d think,” says band leader Michael Kearney). But the key to the Sevilles’ success is their humble entertainer’s ethic—their job is to please your guests, period. Whatever your pleasure—Motown, swing or Justin Timberlake—it’s probably in their century-spanning repertoire—and if it isn’t, they ’ll gladly learn a couple new rump-shakers just for you. To paraphrase Tenacious D, the Bella Nota String Quartet is classically trained to rock your socks off. “This is more than a job,” says cellist and manager Christine Melchert. “It is truly an honor to share in one the most sacred and significant life events of our clients.” Formed in 1999 and composed of professional musicians and music educators, this traditional string quartet—two violins, a viola and a cello—is equally at home with J.S. Bach or Elton John, and their deep well of experience is evident in their smooth melodies and rich harmonies. “We’ve even performed Coldplay and Norah Jones hits,” says Melchert. Their years in the wedding industry are equally evident. Expert coordinators, they’ll help create a memorable, meaningful, stress-free and beautiful day for the couple. 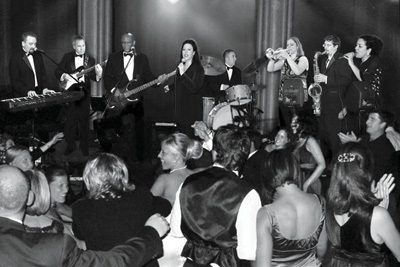 From ceremony to reception, live music can be the perfect accompaniment to your wedding day. From the start of the cocktail hour to the rousing last-call finale, music has the power to set the tone of your reception.